BioStep 2... the difference is in the motion. 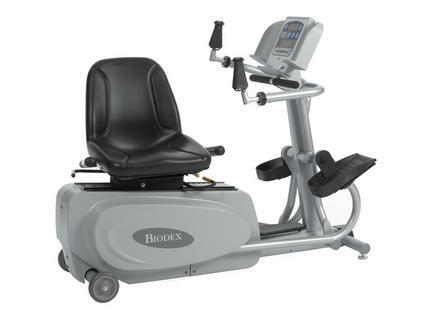 With its feature-rich design, the versatile and durable Biodex BioStep 2 can accommodate a wide variety of user profiles including orthopedic, neurorehabilitation, cardiopulmonary, sports medicine, wellness and general strengthening and conditioning programs for any age group. BioStep 2 is simple to use, requires minimal supervision and allows exercise to progress at a natural pace. The fluid, elliptical motion is forgiving on the knees, ankles, hips and lower back…a natural closed-chain, low-impact, functional exercise. The BioStep 2 reduces joint impact because the user is not required to lift and strike their feet on the walking surface. 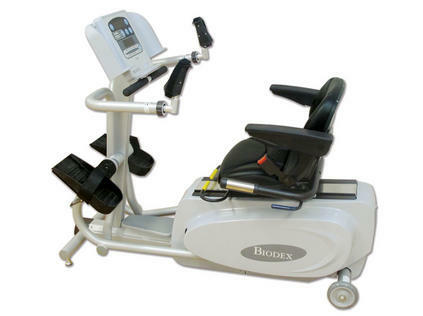 By combining lower extremity motion with upper body exercise, the BioStep 2 provides a total body workout in both forward and reverse directions, thereby involving different muscle groups. The low-impact elliptical motion of the BioStep 2 also helps strengthen the muscles important to maintaining function – those muscles specifically associated with mobility, gait and balance. BioStep 2 incorporates both the upper and lower extremities into the cycling motion; patients experience less local muscle fatigue. This allows similar heart rates to be achieved at lower rates of perceived exertion when compared to traditional exercise ergometers. Blood pressures can be checked while the patient continues to exercise by simply releasing one arm while the other three extremities comfortably continue to perform the exercise. BioStep 2 is ideal for patients who may experience leg claudication during exercise. Patients can easily reduce the effort in the involved leg, while keeping heart rate elevated, by transferring a greater portion of the workload to the non-involved extremities. When the cramping subsides, exercise can be transferred back, proportionately, to all four extremities. BioStep 2 provides a zero impact, safe and comfortable total body workout in both forward and reverse directions, making it ideal for general aerobic conditioning of your adult population. 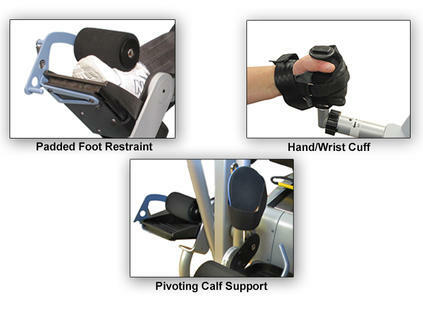 Biodex offers stabilization accessories to meet the challenges of patients with neurological and musculoskeletal issues. Articulating hand grips and footplates add comfort while strengthening the primary muscles associated with balance, gait and mobility. A hook and loop strap that provides a simple solution to secure a user's foot to the footplate during exercise. Like the Foot Strap, a hook and loop strap provides a simple solution to secure a user's hand to the Pivoting Hand grips, enabling controlled motion during exercise. The Seat Belt offers support and security for patients with limited torso control. The Seat Belt fits securely around the lower abdomen of each user and is completely adjustable. The retractable seat belt is there when needed and out of way when not. With the addition of the movable padded armrests, users obtain an added level of comfort and stability when needed. The BioStep 2 can be used with or without the armrests in position. Armrest folds up flush against the side of seat back to provide easy-on and off access. 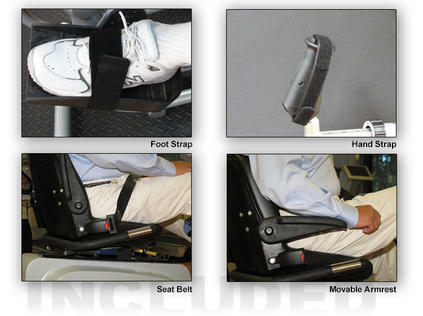 For lower extremity stabilization we offer a padded foot restraint and pivoting calf support. This combination provides support to the calf while allowing the patient to exercise and experience the smooth BioStep motion. The calf support pivots, allowing the ankle to move as it would naturally in gait. The padded foot restraint is a convenient and comfortable means to secure the foot to the footplate, thereby maintaining correct loading of the joints and postural alignment during exercise. NOTE: Pivoting Calf Support can be easily removed when not in use. Patients with hand and wrist limitations will find comfort with the articulating hand grips and security of maintaining stable hand position throughout the exercise session. The Hand/Wrist Cuffs allow users with limited or no hand strength or control to enjoy the benefits of the BioStep’s upper body exercise. NOTE: Hand/Wrist Cuffs are also sold separately. 50 rpm. AC Adapter included. Certifications: ETL listed to UL60601-1 and CAN/CSA C22.2 No.601.1.M90, EN 60601-1: 2nd Edition. EMC compliance to EN 60601-1-2.